It is NORBERT and DOLLY out there! Starting the month of September 2014, and already in the midst of the historical peak of the annual Atlantic hurricane season, mother Nature is giving Mexico a double treat of tropical cyclone impacts on both the Pacific and Gulf coasts. Tropical storm NORBERT is the 14th named tropical cyclone in what has been a rather active 2014 East Pacific hurricane season so far. This storm is moving generally NNW in a favorable atmosphere-ocean environment that nay favor strengthening, possibly to hurricane strength, over the next day or so. Tropical storm DOLLY, the 4th named tropical cyclone of the 2014 Atlantic hurricane season, a rather sluggish one so far, is coming onshore near Tampico on Mexico’s Gulf coast. It appears the main impacts from both these tropical cyclones will be in the form of heavy rains, which always pose the risk of flash floods given the topography near both coastal regions, and coastal flooding. 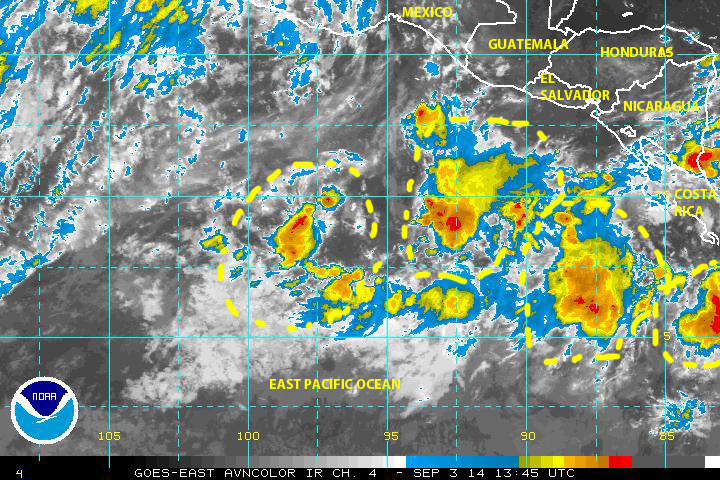 In the East Pacific basin the region off the coasts of southern Mexico, Central America and Panama continue to be populated by numerous storm cells and tropical waves, which may see future cyclonic activity. 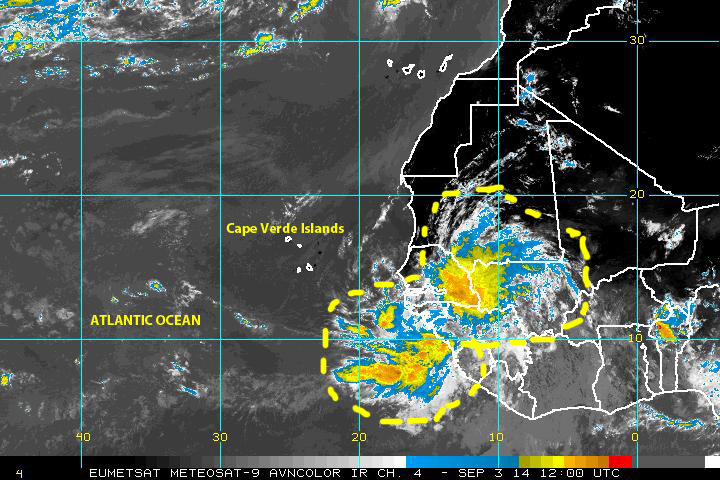 While over in the Atlantic ‘Hurricane Alley’ is basically empty of any significant traffic today, while a well organized tropical wave is nearing the western coastline of Equatorial Africa and the eastern Atlantic near the Cape Verde Islands. We’ll have to monitor this system to see what, if anything, happens with it as it moves westward in coming days. 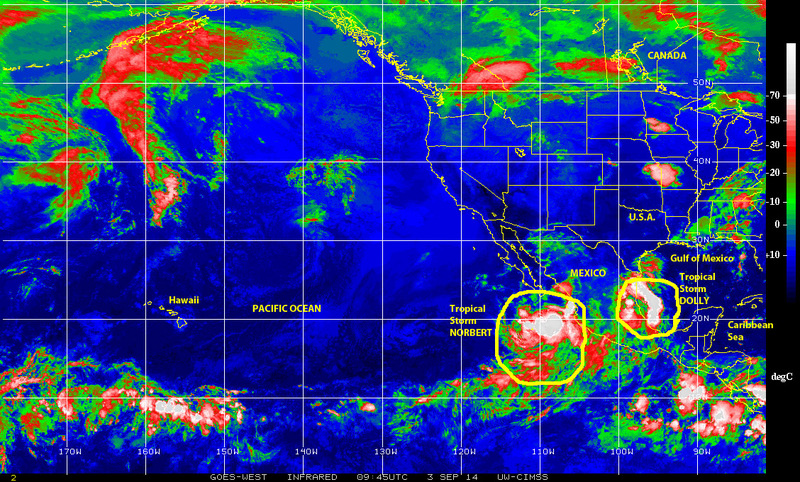 There is still plenty of hurricane season left on both the East Pacific and Atlantic basins. All interests around these basins will do well to remain alert, be prepared, and to keep on practicing mitigation! Previous PostCristobal heads north!Next Post09/12/2014: EDOUARD, ODILE and KALMAEGI etc.